Enhanced support for different authorization methods - Role based access control, attribute based access control etc. The NameNode is the centerpiece of an HDFS file system. It keeps the directory tree of all files in the file system, and tracks where across the cluster the file data is kept. It does not store the data of these files itself. Client applications talk to the NameNode whenever they wish to locate a file, or when they want to add/copy/move/delete a file. The NameNode responds the successful requests by returning a list of relevant DataNode servers where the data lives. 1. Namenode is the place where meta info of the file is hdfs maintained. 2. While reading or writing a file, hdfs clients interact with namenode, to get the location of flie blocks on various datanodes and eventually interact with datanodes. 3. All file permission checks happen at namenode for HDFS. 4. Namnode maintains a POSIX style permission user : group : other but also supports fine grained access by applying Hadoop ACLS. Please follow the following link to have a interesting perspective of HDFS compared to Linux ext3. 5. dfs.namenode.acls.enabled = true enables ACLs on namenode. 6. To know more about hadoop ACLS follow the link. 7. Hadoop POSIX permission are not sufficient to decide all possible permission applicable on a given file of directory. HDFS permission checks happens on hdfs client interaction with Namenode. Namenode has his own ACLs and Ranger policies to apply. 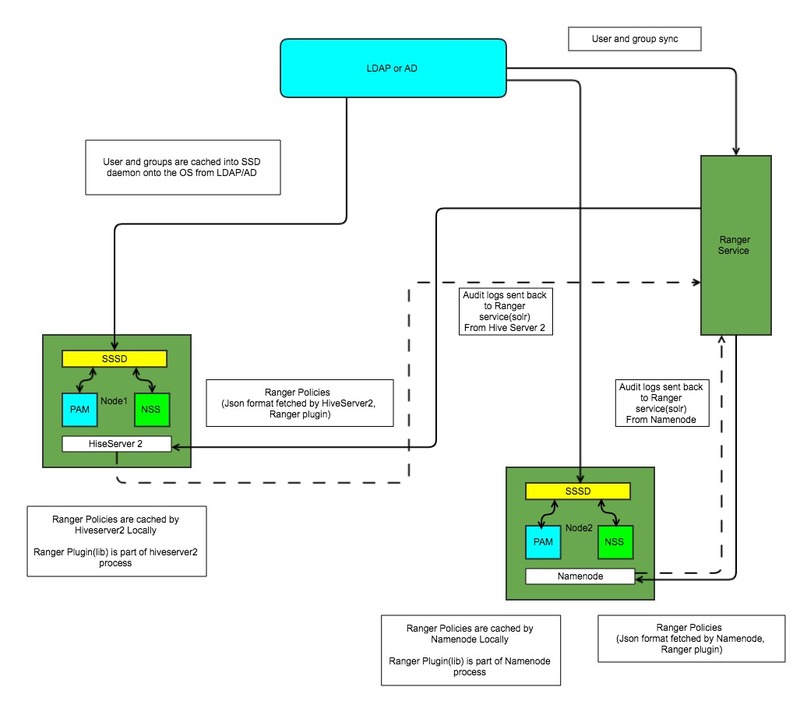 The application of permission starts with Ranger ACLs, and then to hadoop ACLs. 1. Ranger policies are fetched by Namenode and maintained in local cache. Do realize hdfs ranger plugin is not a separate process, but a lib which is executed along with Namenode. 2. User Authenticates to Namenode using one of the specified authenticating mechanism simple, Kerberos. 3. Namenode gets the username during the authentication phase. Do remember even with Kerberos Authentication groups available in the ticket are never used. 4. Based on how core-site.xml if configured Namenode either lookups LDAP to fetch groups of the authenticated user OR it does a lookup from the underlying OS (NSS -> SSSD -> LDAP) to fetch the groups. 5. Once groups are fetched, Namenode has mapping of user to groups of authenticated user. 6. Hdfs Ranger plugin has mapping of user -> groups -> policy, now the groups which were fetched from namenode are used to select the ranger policy and enforce them. 8. Namenode will fetch the groups at its own end (LDAP or through OS) and only the overlapping groups with the ranger groups rules will be used while enforcing the policies. 9. Namenode (hdfs ranger plugin lib) will write audit logs locally which is eventually pushed to ranger service (solr). 10. If due to some reason groups are not fetched from Namenode for the authenticated user all the Ranger policies mapped to those groups will not be applied. 13. IF there are no ranger policies for the user then Hadoop ACLs are applied and appropriate permission is enforced. RangerHdfsAuthorizer => calls checkPermission => which internally calls gets groups of the authenticated user using UserGroupInformation class. checkPermission : from userName get groups and check privilidges.